Over the next few weeks Speedway Australia will catchup with and introduce to Australian Speedway fans , drivers who will be offered contracts to participate in a new era of World Series Sprintcars – the 31st Annual Tour. With venues ‘Locked and Loaded’ this competition has the potential to be one of the most competitive on record and one race fans can be proud to share in. The June edition of Oval Express Speedway Magazine draws our attention to a ground swell of young Sprintcar drivers currently making headlines across Australia with strong performances beyond their years. 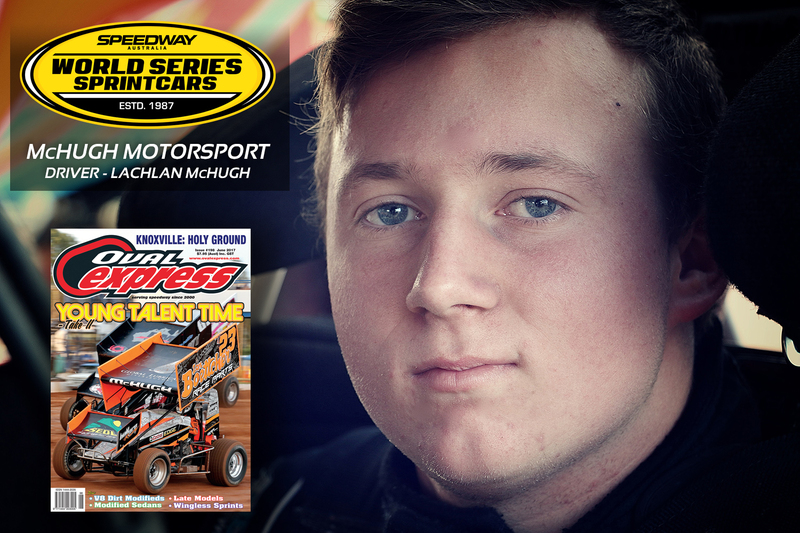 Gracing the cover and leading the feature article titled ‘Young Talent Time’ is the Gold Coasts Lachlan McHugh. Lachlan is a graduate of the 2015 Speedway Australia Rising Star program and it is with delight Speedway Australia announces ‘Lockie’ as the first driver to be included as a 2017-2018 World Series Sprintcar competitor offered a contract for the 31st tour of Australia’s toughest Sprintcar Series. The 19 year old turned heads in winning the preliminary night A- Main of the 2017 Australian Sprintcar Open held at Ausdeck Patio’s Archerfield Speedway in a field that boasted World of Outlaws Champion Donny Schatz, Australian Champion Kerry Madsen, World Series Champions James McFadden and Jamie Veal and 2017 Avalon Raceways Presidents Cup winner Carson Mercedo of the USA. McHugh began his dirt track career in junior sedans and was impressive on debut to gain selection in the Rising Star program. “Rising Star provided great insight on how to shape my career as a whole package, not just with on-track results.” Lachlan said. The Queensland Sprintcar Association 2016 Rookie of the Year boasts a formidable team with his Dad dual Australian Super Sedan Champion Jamie McHugh as Crew Chief of the Ian Boettcher Race Parts/Cool No.23. Lockie joins an impressive list of drivers eligible to contest WSS31’s prestigious Bunyip Print/WSS Rookie of the Year competition. “I would not have the opportunity to experience the World Series Sprintcar dream without the support of Dad, my Mum Sharon, Sister Holly our race crew and partners Ian Boettcher of IRBP., Castrol Edge /Global Lubricants., Sedl Contracting., Boltpro., Slade Shock Technology., Right Price Autoparts.”, McHugh said.